On the worst end of the Oliver-Stone-is-batshit spectrum you get a dated movie like Natural Born Killers (1994), and on the best you get the sublimely absurd U-Turn (1997). The mediocre Savages plays it safely down the middle. Based on the crime novel by Don Winslow, Savages follows burnt out war vet Chon (Taylor Kitsch) and stoner-botanist Ben (Aaron Johnson), pot-growing partners who must safely recover their mutual lover O (Blake Lively), kidnapped by desperate cartel queen Elena (Salma Hayek) and her henchman Lado (Benicio del Toro) after the buddies rebuff an offer to merge. 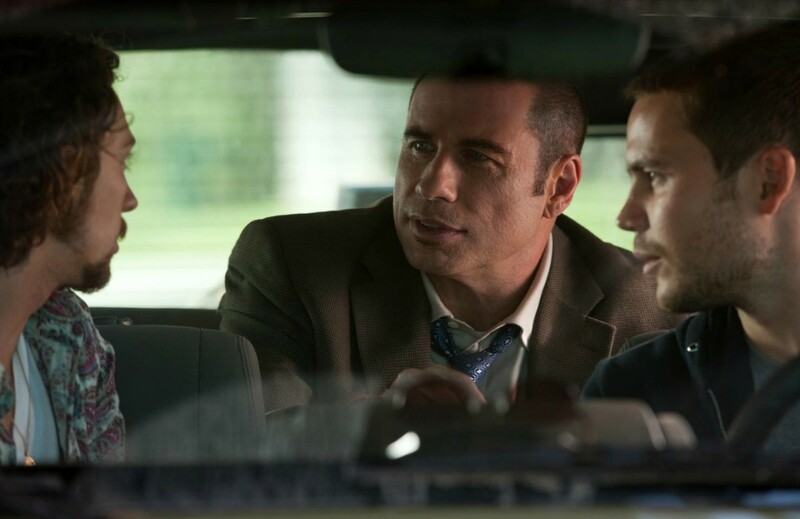 John Travolta plays Dennis, a corrupt DEA agent working both sides to his favor. Savages' mash-up between Malibu drug culture glamor and grimy, South-of-the-Border criminality is a promising backdrop with plenty of opportunities for Stone's famous self-indulgence. The film opens with a creepy, handheld digital cam depiction of the types of decapitations plaguing Mexico today. And an excruciating torture scene midway through the film is made all the grislier because one Oscar-nominated actor is the subject and his mutilated eyeball hangs from one of his bloody sockets throughout. But even then, Savages lacks Stone's typical brio. It all plays like Stone by the numbers because he never seems to push Savages with the ferocity of even a failed experiment like Natural Born Killers. Don't blame Savages' veteran stars. As one might expect, the most eccentric is Del Toro, who delights in adding unusual touches to Lado like a predilection for recording his crimes and a near phobia of how Elena might retaliate if she discovers any of the ways he's fouled up throughout the film. Next to Elena's more respectable looking employee, Alex (Demián Bichir), Lado looks all the more twisted. Hayek brings some interesting shadings to Elena, a woman bent on preserving her way of life as she tries to hold her late husband's cartel together for her children. In describing her daughter to O, Elena says, "She's ashamed of her mother, and I'm proud of her for it." And finally there's Travolta, in what I believe is the first part he plays without his toupee. Relinquishing his ego to the role seems to have freed him up to bring out the more craven, even sniveling, aspects one usually associates with some of his more interesting villains. Cast in supporting roles, each star brings a relish to their performances sorely lacking in that of the leads who, in comparison, seem cowed by the talent they must play against. Kitsch and Johnson seem locked in a battle over who can underplay more than the other, the stasis they emanate bleeding into long stretches of the overlong Savages. The casting of Lively is even more problematic. Savages is narrated by O, and Lively's line readings are as flat and dumb as you might expect from a surfer girl like O. At times, though it's hard to know whether this is intentional, if the exposition is poorly written or if it just sounds that way because of the actress. For instance, it's not enough to know that "O" is short for Ophelia. The narration has to remind the audience who Ophelia is in Hamlet, all but spelling out how the metaphor fits. And if it hasn't occurred to a viewer how familiar the outlaw lovers' triangle which forms the spine of Savages is, O takes pains to tell us it was also central to Butch Cassidy and the Sundance Kid. Savages is mildly entertaining for its first hour-and-a-half, a slight anxiety building in the viewer as one waits for it to turn some kind of corner. Things start to click as Stone approaches the final showdown between Elena and the two drug suppliers. The director begins to emphasize the parallels between Savages and—all references to Butch Cassidy to the contrary—its true source of aesthetic inspiration, the Spaghetti western. Cameras begin to circle the film's main players in full 360s, and the yellow, grainy haze of the film stock seems to get more and more blown out. The score seems to crescendo with touches of opera and snare drums right out of Morricone's playbook. But then Stone pulls the rug out from under you in one of the worst cop-out finales I can think of for some time. Savages is the work of a director who, after years of being ridiculed for his excesses, has sadly decided to neuter himself. I'm going to be seeing this one this weekend for two reasons, I've always loved Stone's films, of course I speak of the old ones, before he got his nuts cut off by Hollywood. And for Benicio, one of the finest actors to grace the silver screen. I hope it won't dissapoint, but your review sounds like it will. Im curious as hell to see how Stone messed this one up. I hate it how Stones films dont have that edge or that acid sense of humor or darkness they used to have. Im also curious to know why you think that Natural Born Killers was a failed experiment? I love that film, and wrote a glowing review for it. Thanks for your excellent review. Based on your assessment of this movie, I think I'll pass on it. It's a shame when edgy, original directors are neutered by Hollywood. Mediocre at best might be the right phrase. I mirror your dislike of Lively, having read the book first I honestly can't have imagined a worse performance/interpretation of what was an important character.